In an emergency, seconds count. What if you couldn’t call 911 because you couldn’t reach an outside line? On this episode of Lawyer 2 Lawyer, host J. Craig Williams interviews Henry “Hank” Hunt, the man petitioning for Kari’s Law, and FCC Commissioner Ajit Pai. Together they discuss the importance of uniform dialing for 911. Henry Hunt’s nine year old granddaughter, through no fault of her own, could not reach 911 to save her mother. Despite her multiple attempts, the calls would not connect because the hotel’s phone system required dialing 9 to get an outside line. In the wake of these events, this Texas grandfather started the Kari’s Law Petition which calls for mandated direct-dial 911. Ajit Pai serves as FCC Commissioner focusing on regulatory environments where competition and innovation flourish. He is the former Associate General Counsel at Verizon. In addition, he has served as Senior Counsel with the Department of Justice and Chief Counsel to the Senate Judiciary Committee’s Subcommittee on the Constitution, Civil Rights, and Property Rights. Comm. Pai: Most people when they go into a hotel, a motel or an office building today generally have no idea whether they have to dial an access code like nine first, whether they should just dial 911, and that’s especially tragic when you think about the fact that 911 is perhaps the best branded number in the United States. Every child, every adult knows that when you’re in trouble, call 911 and someone will be able to help you. If that’s not the case in the hotels and office buildings, then we need to do something to change that. Voice: Welcome to the award winning podcast, Lawyer 2 Lawyer with J. Craig Williams and Robert Ambrogi, bringing you the latest legal news and observations with the leading experts in the legal profession. You’re listening to Legal Talk Network. 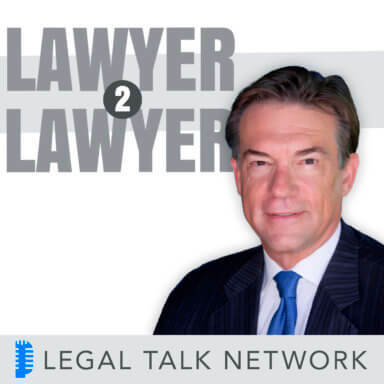 Craig: Hello and welcome to Lawyer 2 Lawyer on the Legal Talk Network. This is Craig Williams coming to you from a very sunny but chilly Southern California, no where near as cold as it is for my cohost Bob Ambrogi who’s off today. I read a legal blog called May It Please The Court. Before we introduce today’s topic, we’d like to thank our sponsor Clio, an online practice management software program for lawyers at goclio.com. Today we’re going to be talking about the need for universal 911. A recent article in the Los Angeles Times announced that the FCC has launched an inquiry into the need for universal 911. This inquiry follows the death of a woman whose child was unable to dial 911 from a hotel because the phone first required the user to dial 9 to get an outside line. The woman’s father started a petition demanding direct dialing for all phone systems. Today the issue has the attention of government officials at both state and national levels. Joining us today from the Federal Communications Commission is FCC Commissioner Ajit Pai. Prior to his current role at the FCC, Commissioner Pai has an impressive career as a trial attorney for the United States Department of Justice, an associated general counsel for Verizon Communications, and Deputy General Counsel for the Federal Communications Commission. Welcome Commissioner Pai. Craig: We also have Hank Hunt. Hank has gathered over 400,000 signatures for his petition and we thank him for taking time to join us today. Craig: As we start out this, can you describe what universal 911 is, why there’s such a problem with it, and what it was that made you decide to start the petition and to make this change? Hank: Universal 911, enhanced 911 systems, I’m not fully up on the tech end of it, but I do know there’s supposed to be direct dial to 911 dispatchers and the new enhanced versions will give 911 dispatchers the address, the floor number, and room number of wherever that telephone may be in any building. I know in some hotels I’ve been up and visited, there are no instructions on how to dial 911 or there aren’t instructions to dial a 9 first or an 8 or to dial 66, or to dial the front desk. There’s nothing consistent and especially at hotels. That’s what we’re seeking to change. My nine-year-old granddaughter tried four times. She was in the room while this was happening with her younger sister and younger brother. After the fourth try, she got them outside the room. They were [inaudible 03:30] and they would call 911 for them. Craig: It’s a tragic, tragic situation and we’re just tremendously sorry for that situation and your losses. Hank, are there any organizations other that you helping you put this together? Hank: Yes, there’s Mark Fletcher with the Valiant Corporation in New Jersey. He has been a tremendous help along with Mr. Pai from the FCC. We have come up with a logo for a no-nine-needed [inaudible 03:55]. He has really spread the word and even up in Canada, he interjects the story into his conferences where he goes today. I believe he’s in LA today. Craig: Excellent. Mr. Pai, what has been the response from the public and what is the FCC doing at this point? Comm. Pai: The response has been tremendous and I should say first off that Hank deserves tremendous credit for bringing this to the nation’s attention. I think he’s a great example of that old aphorism that one man with courage makes a majority. Because of his efforts and the efforts of people like Mark Fletcher, this issue is becoming something that everyone is becoming aware of and from my own perspective, I took an interest in it not just because one of the core FCC responsibilities is ensuring the safety and of property, but also because I’m a parent and I want my kids to be able to dial 911 with the confidence that they will be able to reach somebody who can help them in that moment of need. Tragically, Mr. Hunt’s granddaughter wasn’t able to do that. I think there is a great opportunity to raise awareness of this issue and that’s what I’ve tried to do by initiating an inquiry a few weeks ago in which I sent a letter to the CEOs of the top ten hotel chains in the United States just for the basic facts. When someone dials 911 in one of your rooms, what happens? Do they get static? Does it go to the front desk? Do they connect directly with trained emergency personnel? Those are facts that we simply don’t know and I think that most people when they go into a hotel, a motel, or an office building today generally have no idea whether they have to dial an access code like 9 first, whether they just dial 911, and it’s especially tragic when you think about the fact that 911 is perhaps the best branded number in the United States. Every child, every adult knows that when you’re in trouble, call 911 and someone will be able to help you. If that’s not the case in the hotels and office buildings, then we need to do something to change that. Craig: Hank, beyond the inquiry that the FCC has initiated and the cooperation from Avia, what kind of changes do you want to see come out of the petition? Hank: What I’d like to see is uniformity, especially from Mr. Pai. He has a family. He has young children. Family’s take vacations across this country daily all year long. They stay in different hotels and different locations. You cross the state line and you may be able to dial 911, but a quarter mile later, you have to dial a 66 or if you do dial 911, it re-directs you to the front desk. That’s time wasting and I believe in a city in Delaware, they’re actually looking at it as interference with a 911 call. In my opinion, that’s exactly what it is. It’s interference with a 911 call. I know the technology is there on a lot of phone systems already, and it’s just a matter of programming, not necessarily purchasing anything. Craig: Ajit, it sounds like Delaware’s almost making it into a crime. What is interference with 911? What is the concept behind that? Comm. Pai: I think in terms of the solution, I think the basic problem is that a lot of these multiline telephone systems or MLTS, some of them are older and they don’t contemplate that someone would be dialing 911 and want to directly access public safety answering point or PSAP, but especially for some of the newer systems, it’s just a matter of re-programming. So if a hotel owner for example is aware of this issue, then he or she with relative ease reprogram that MLTS system and make sure that the appropriate steps are taken so that someone is directly connected to the PSAP, that location information is transmitted along with that call and so forth. What we’ve found not far from where Mr. Hunt is, in Lubbock, Texas and down the road there are couple of hotel owners who have heard about this story and have taken steps on their own to solve the problem without the need to buy expensive technology or hire somebody to take care of it. It’s generally a pretty easy fix once you’re aware of it if your system can be re-programmed in that matter. Craig: What are the legal consequences of having a non-functioning 911 system at your hotel? What are the legal consequences? Comm. Pai: It really depends, as a matter of FCC law, there isn’t a lot in terms of liability that would attach to that kind of failure. Obviously in terms of contract and tort law, there might be other issues that are involved, but it really depends on the particular situation, the laws of the state in which the hotel or the office building is cited, and so forth. At this point, we’re hopeful that even without the prod of legal liability, either from the FCC or private perspective, that hotels and office building owners will do the right thing and try to reprogram the systems as appropriate to make sure that people are able to directly access emergency personnel. Craig: Hank, have there been any legal consequences that have arisen out of your situation? Hank: As far as the hotel, no sir. Craig: What kind of legal consequences do you want to see for people that know about this, but don’t fix it? Hank: That would be something I guess would be up for debate. I’m really not versed in that kind of thing. I would like to see it in the fire code, locally and nationally. Then there would be the fire code findings and whatever that might occur that’s not happening, but I think any phone … at a restaurant I asked them how they did it and you have to go and get a four-digit code from the manager and it changes daily, in order to dial out. If something were to happen where they immediately needed to get to a telephone and dial 911, they would have no idea how to. I understand that cell phones are out there, but in an emergency, the first thing people do is run straight to the phone and dial 911. They may not be thinking that there’s an additional line that needs to be added to that. There’s some number to be dialed. It’s what happened in my granddaughter’s case. Craig: Ajit, I guess the FCC is at present in the fact gathering mode. Is that how you see it? Comm. Pai: That’s correct. The inquiry is still ongoing and I asked the hotel chains to report back to me by February 14th. We’ve received some initial and positive feedback from both the trade association that represents a lot of hotels and some of the individual hotel chains themselves. I’m hopeful that by February 14th or shortly thereafter, we’ll have a better sense of what exactly the nature of this problem is. Is it ubiquitous? Is it relatively isolated? Are there certain best practices that some companies are using? I think once we have the basic facts, we’ll be in a better position to figure out how to address the problem. Craig: What do you see as the possible options for the FCC in terms of taking? Obviously you can adopt a regulation. You an recommend some laws to Congress. What kind of steps do you think the FCC is going to be taking? What’s your anticipation? Comm. Pai: I certainly haven’t prejudged the issue at all. It might simply be an issue of awareness, in which case, I will do my part and I know the support of my colleagues in beating the drum to make sure that everybody knows about the importance of this issue because what we found as I’ve hinted at earlier is that in a lot of these cases, awareness is the best tonic to solving the problem. Any hotel owner who’s aware of the problem doesn’t want an emergency like this such as the one that happened to Carrie Hunt Dunn to happen in their hotels. That would be one possible solution, but other people have proposed different solutions as well and there are options such as they type you mentioned, either regulation or making recommendations to Congress. Since we’re still in the fact gathering mode, I haven’t predetermined I or the FCC should take, but what I can say is we’re committed to solving this problem. What happened to Mr. Hunt’s granddaughter just shouldn’t happen to anybody else in this country, given how robust our 911 infrastructure is and how widespread acceptance of 911 is in this country. Craig: I would completely agree with you. Hank, what kind of reaction have you gotten from the local state governments? Apparently you’ve gotten major attention here from the FCC, but how about the individual states? Hank: As far as government officials, I haven’t heard from anyone but Mr. Pai. Mr. Gohmert, my representative for the district one here in Texas has spoken on television in support of it, but as far as personally hearing from anyone I haven’t heard, but to add a little bit to Commissioner Pai’s comments about awareness, I was at a hotel this past weekend in Little Rock, Arkansas and the manager and the clerk there did not know whether you had to dial a 9 first or not. The thing of it is, I tested it, I called, I notified first telling them I was going to test it, and you don’t have to dial a 9, it was just 911, but yet the hotel manager did not know that. I think that’s where the awareness comes in. The majority of the people signing on this petition are saying just that thing. I did not know you couldn’t dial 911 from a hotel. Some you can now, but the majority of the people just don’t know. Craig: Frankly, it surprised me. It’s not a situation that I’d ever seen before. Have you contacted any of the phone companies or the phone manufacturers, Panasonic and others to say, hey you need to make this change in your programming. Hank: I think the change is there if the technology progresses. I know that some phone systems that are 10 to 15 years old are capable of doing it, not necessarily the full function of a 911 system, but the office building that I work in that was built in the 80s and our programmer has programmed it to dial 911 straight to the dispatcher, but it will not give them the location of that phone, which is something that we aim for in the future. This isn’t something that we’re looking for to happen overnight. Obviously it’s going to take a while, but even if we can’t get a law, maybe just the public pressure. I heard someone say one time that laws when ethics failed. I just don’t think ethics has failed that much in this country. Craig: Before we move on to our next segment, we’re going to take a quick break and hear a message from our sponsor. Kate: Hi, my name is Kate Kenny from Legal Talk Network and I’m joined by Jack Newton, President of Clio. Jack takes a look at the process of moving to The Cloud. How long does it take to move to The Cloud and is it a difficult process? Jack: With most Cloud commuting providers, moving your data into the cloud is something that takes just minutes, not hours or days to do. You can get signed up and running with most services in just a few minutes. Even if you have an existing legacy set of data that you want to migrate to a web-based practice management system like Clio, there’s migration tools and migration services that we’re able to offer to ease that process. Most firms can be up and running to The Cloud, in The Cloud is less than five minutes and can have their data imported in a matter of hours or days. Jack: Thank you and if you’d like to get more information on Clio, feel free to visit www.goclio.com, that’s G-O-C-L-I-O.com. Craig: Welcome back to Lawyer 2 Lawyer. I’m Craig Williams and with me today is FCC Ajit Pai and Hank Hunt who is the grandfather of the little girl who tried to dial 911 at a hotel and was unsuccessful in doing so. Commissioner, we’ve been talking about some of the programming and the regulations. Is it appropriate for the FCC to draft a regulation that requires the manufacturer of phones to provide enhanced 911 and a direct line for a 911 phone call or is that already the law? Comm. Pai: Generally speaking, what Mr. Hunt says is correct, that the technology that is being deployed now already incorporates that type of functionality and so it’s generally just a case of the particular purchaser making the programming change in that technology and one of the examples that happened down the road from where he is in Marshall, Texas was a woman named C.J. Clayton who operates the Staybridge Suites in Longview, Texas. As she said, they have an integrated 911 system, but they had to dial 9 first to get an outside line because no one has every made them aware of this issue. In that case, as is the case in a lot of hotels I suspect across the country, here again it’s just simply a case of awareness and as she said, once she heard about Mr. Hunt’s situation, she called up her corporate office and said, Look you need to reprogram this immediately and that’s exactly what they did. In those kinds of cases, you wouldn’t need an FCC regulation to solve the problem, but again as I said, to the extent one of the FCC’s core responsibilities under the Communications Act is public safety in communications, then certainly we have some jurisdiction in this area and I think that it’s incumbent on us to use it to the extent we have to to make sure the problem is solved. Craig: I think that you’re both saying essentially is that this is really more of problem of awareness, because as soon as people find out about it, they’re quick to change it and they get it and they understand it and they don’t want to have this kind of situation arise again, and they’re doing everything possible. Ajit, what kind of public service campaign as an adjunct to the 911 branding that we’ve undergone, what kind of a public service campaign do we need to be able to get this word out to, I’m assuming that these are mostly hotels and businesses and manufacture ring more on the commercial side of the phone usage. Comm. Pai: It’s a challenge. Obviously there’s so many issues that are in the public square every day that are demanding people’s attention, but one of the things I’ve tried to do and that Mr. Hunt has done much better than I ever could, is that he’s using every form possible to bring this issue to people’s attention. Whether it’s this podcast, whether it’s a press release, whether it’s a statement, whether it’s sending a letter to all these CEOs and then publishing the results, whether it is making speeches as I did last Thursday in which I pointed out that this is still one gap in our 911 functionality. Just to give you some context, the FCC last week was voting on a proposal to make text to 911 more common. This is sort of the next generation of 911 capability. I pointed out that that’s very important and I’m certainly supportive, but we need to fix the 911 basics, that basic functionality that a lot of us take for granted and in some cases wrongly. From my own small bully pulpit, I intend to use all the sources of the media that are at my disposal to make sure that people know about this issue. I think in combination with the great work that Hank is doing, that Mark Fletcher, and really intrepid reporters are doing digging into this issue, I’m pretty convinced that as more people become aware of the issue, they’re going to realize that these issues matter and that action needs to be taken. Craig: Hank you earlier in the podcast made a comment that people all across the country travel frequently and they go from hotel to hotel to hotel and I’m a grandfather too, the one thing I’ve noticed as I’ve gotten older is that the world has gotten a little bit smaller and we tend to travel to Europe and to South America and to Asia and Russia and other countries, what’s the status of those? I know there’s a million different countries and this is a very broad question, but when Americans travel to other countries, what kind of expectations should we have for being able to contact emergency services in a foreign country. Hank: When in Rome, I guess. I haven’t done much research on that as far as other countries. What I’m doing here is enough for an old fellow like me here in Texas. [inaudible 19:01], but I then I was at I believe at the European Emergency Association that has I believe it’s 112 that they dial. I’m not quite sure on that, but I do know that they are implementing or have implemented emergency number similar to the 911 systems that we have here. I would tend to believe they have the same problems there as we do. Craig: Hank, you gotten any calls to get out on the lecture circuit and talk about this or is this something that you’re doing from your home and shaking your fist as much as you can? Hank: Yes, I’ve been invited tentatively to several conferences in Dallas and Michigan, and it’s even been suggested that I go to Warsaw, Poland. It’s there I guess 112 or 911 emergency systems or dispatchers over there. Hank: It’s amazing the amount of response that we’ve gotten. I initially wanted to 100 signatures and take it to my congressman to show him how strong my petition was. We’re pressing in on half a million. There’s no way we could have not that without Commissioner Pai and without Mr. Fletcher. I can’t tell them how much that means. Comm. Pai: If I could just chime in, Mr. Hunt is always too kind and he is really the driving force behind this. I’m just privileged to have a position of responsibility where I can heighten awareness of the issue myself. If I could add just one quick point on the international situation, one of the difficulties in addition to the fact that some places like Europe have the 112 system, there’s some countries where there’s not a single 911 line. For example in India I just recently read a story about the fact that every type of emergency that you might have requires a different help line. For the police emergency help line, it’s 100, for fire it’s 101, for an ambulance it’s 102, for traffic accident is 103. There are different lines for senior citizens, for woman and children. It is a complete mess. I think one of the significant advantages that we should be mindful of here in the United States is that we do have general acceptance of 911 as the general framework around emergency response. That I think is going to be a tremendous asset and hopefully whatever we end up doing with regard to the issue of MLTS, we can export the world over. We don’t have to see this situation replicated so many different times in so many countries. Craig: Ajit, I’m going to put a little bit of a finger on you here, I read in the beginning of the introduction that you were former general counsel for Verizon Communications. Craig: Have you reached out to them? Comm. Pai: I haven’t yet about this particular issue, but as time goes on depending on what the response is that we get from the hotel chains on February 14th, I certainly want to talk to them extensively because they interact quite often with the public safety answering points around the country. They might have some really good suggestions on ways to move forward and they’re going to be a part of the conversation to be sure. Craig: Excellent, and I’d also encourage you to make those inquiries and send out those inquiry letters to the manufacturers of the phone systems, obviously AT&T, Verizon, Avia, Panasonic, and I’m sure there are a number of others, not necessarily because as Hank and you have both reported, to make any changes to the systems, but more to ensure that there’s public awareness of the consequences of the programming of those systems after they get out. Comm. Pai: Absolutely, and one of the heartening things that I’ve found in our initial conversations with some of these manufacturers is that they really have a strong interest in getting this right too because they know their technology can save lives and they certainly don’t want to be the reason why this problem doesn’t get solved. Thus far at least, they’ve been very supportive of this effort. I’m really excited to work with them to get it solved. Craig: Excellent. We’ve just about reached the end of our programming where it’s time to wrap up and get your final thoughts. Hank, what I’d like to do is turn the microphone over to you and I’d like you to do a few things here. Give us your final thoughts. Tell us where we can find the petition. I understand it’s on change.org and also provide our listeners a means of reaching out to you and assisting you if we’ve gotten anybody that’s listening to this podcast that’s motivated to help solve this problem so we don’t have more situations like your granddaughter faced. Hank: I appreciate it. First of all, thank you and thank you, Mr. Pai for being here today. The look on my granddaughter’s face that I tried and it didn’t work made me feel like a failure myself because we teach our children to dial 911. We teach our children to trust police officers and the [inaudible 23:21] is the United States that says dial 911. It doesn’t say dial 9911. We don’t teach them to dial an extra number or we don’t teach them to try to find the instructions for the phone to find out how to use that. We teach them to dial 911. I think in my personal opinion and of course, I’m biased at this point now because I’ve had it hit pretty close to home, but I just think this should be a consistent thing across the country and I think branding it somehow someway. My vision was maybe using that symbol or another symbol in hotels that do have these systems they can use in their advertising, so if people traveling sees these, they know that they have hotels that will dial 911 directly. If other people agree, then we have a petition at change.org/karislaw. You can contact me through that web site and you can also contact Mr. Pai and he can get in touch with me or vice versa. Craig: Thank you very much and Mr. Pai, we’ll turn it over to you. Comm. Pai: First I want to say just thank you once again for having me on the podcast. We really appreciate you and your listeners interest in this issue. Thanks again to Mr. Hunt, as I said, from where he started six weeks ago to where we are now, it’s just a tremendous example of citizen action. I really appreciate what he’s doing. In terms of getting in touch with me, I try to make myself as accessible and responsive as possible, and you can always find me on e-mail, [email protected] is my e-mail address. I’m also pretty active on twitter and my twitter handle for those of you who use twitter is @ajitpaifcc. I’m pretty responsive on any of those formats, so if any of you have suggestions on things you think we should be doing, examples of situations that could have been avoided in terms of direct access to 911, definitely let me know. I can tell you that it doesn’t just go into the ether. I really take this stuff seriously and I really do mean it when I say that I want to be a public servant in the real sense of the word, accessible, responsive, and hopefully someone who gets results. Craig: Excellent. Thank you very much for both being on the program. The time is now flipped over to me to give you 30 seconds to share my closing thoughts before I’m cut off by the buzzer so here we go. Hank, I have to tell you as a grandfather myself, I can’t imagine what you’ve gone through and the frustration that you’ve felt and I’m so proud of you for making these steps to make these changes. I’ll let you know that you had a direct effect on me. I have a 911 system in my home, a business 911 system, and I tested it when I read the article about you and it did not work, but I can guarantee you that it works now. My four grandchildren when they get here this year will be able to dial 911 if it happens. Thank you for making a difference in my life. Hank: That’s one, Commissioner Pai. Comm. Pai: Hey, one down. Many more to do. Craig: You got one. It’s the start. It’s the way that things happen. Thank you so much for taking the time with us today to join us and we want to invite our listeners to come back and listen to us again. When you want legal, think Lawyer 2 Lawyer. We’ll see you again soon. Voice: Thanks for listening to Lawyer 2 Lawyer produced by the broadcast professionals at Legal Talk Network. Join J. Craig Williams and Robert Ambrogi for the nest podcast covering the latest legal topic. Subscribe to the RSS feed on legaltalknetwork.com or at i-tunes. The views expressed by the participants of this program are their own and do not represent the views of nor are they endorsed by Legal Talk Network, it’s officers, directors, employees, agents, representatives, shareholders, and subsidiaries. None of the content should be considered legal advice. As always, consult a lawyer.